Based on the Fair Credit Billing Act passed by the U.S. Congress, your bank is not allowed to hold you liable for more than $50.00 of fraudulent charges. If your bank should decide to exercise their right to hold you liable for that $50.00, Bounce N Slide Party Rentals will reimburse you for that amount, up to the full $50.00. www.bnsrentals.com will only cover your liability if the unauthorized use of your credit card was caused by no fault of your own from purchases made with www.bnsrentals.com while using our SSL secure server. Here at Bounce N Slide LLC, we do our best to accommodate all customers in times of unforeseen weather and/or emergency conditions. For this reason, we stay tuned day and night to the local weather conditions in and approaching our area. We ask that all customers do their part and stay informed as to any weather conditions approaching their area. In order for us to better serve all customers, we have developed what we feel is a fair policy for cancellations and rain checks. Sometimes rain may be occurring in one part of town but not in the other part of town right next to it. For this reason WE DO NOT CANCEL DUE TO WEATHER unless we feel it would endanger our equipment. This decision is left solely to the customer. Please feel free to give us a call should you have any questions regarding our policies. Deliveries start at 7am and end before your scheduled party time on the contract. Pick ups start at the party end time on the contract. We follow the GPS and pick up in that order. We may pick up 5 hours after your party end time. Sometimes as late as 11pm. The customer is responsible for notifying the office BY 9PM the day before if they need to cancel the rental. Once the equipment is delivered, the FULL AMOUNT IS DUE regardless of total time used. All decisions to cancel due to weather or any other reason need to be made the day before. We ask that the customer be informed of all weather conditions approaching by watching or listening to their local news. Please understand all bounce houses or combos may get wet from the sides or the emergency escape on top. Some inflatables do not have tops. All orders booked require a deposit. The deposit will never be refunded for any reason, but will be credited for a future rental. 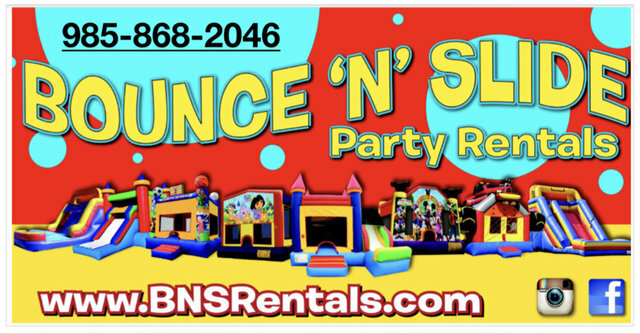 Bounce N Slide Party Rentals provides live support during Business Hours to answer all your questions about party rentals, bounce houses, spacewalks, moonwalks and slides. To speak to someone about inflatable party rentals, please call . We have event experts ready to answer your immediate questions about using our party rental equipment. Thank you for visiting Bounce N Slide Party Rentals - your source party supplies, rentals, and bounce houses and water slides.